Mark's Tickets is the best place to find tickets for Arizona Cardinals fans. Just check this page for any new events or schedule updates throughout the year. We sell tickets to every Arizona Cardinals game around the world. We know how passionate Arizona Cardinals fans can be about football, so we make sure to have hundreds of tickets for every game available right up until it starts. For those looking for cheap Arizona Cardinals tickets, we offer tickets starting at very low prices (many times below face value). We offer tickets in most sections of every venue that you can see Arizona Cardinals. Simply choose the city or venue that you are interested in below, and you will be able to see all of the available seats. Do not forget that Marks Tickets also specializes in sold out Arizona Cardinals tickets. No longer will sold out shows prevent you from seeing Arizona Cardinals. The Arizona Cardinals are a professional football team that plays in the NFL. 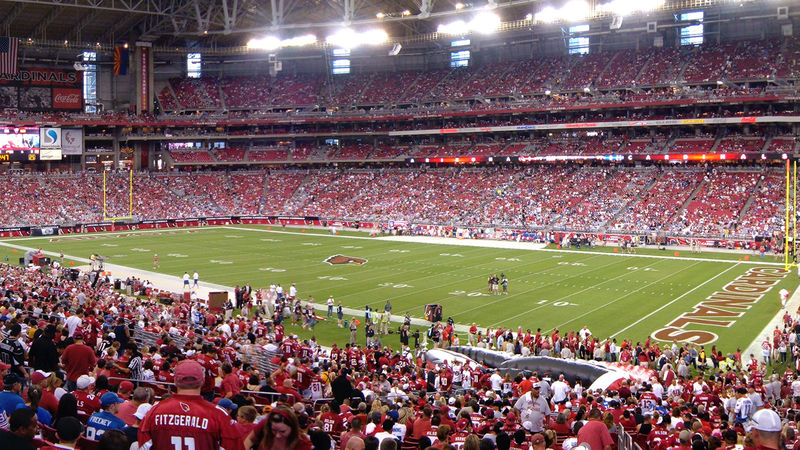 The Cardinals play their home games at University of Phoenix Stadium in Glendale, Arizona. With 16 games per year, and 8 being home games, The Arizona Cardinals are a professional American football team. They are currently members of the Western Division of the National Football Conference (NFC) in the National Football League (NFL). The Cardinals were founded in 1898, and are the oldest continuously run professional American football club in the United States. The team was established in Chicago in 1898 and was a charter member of the NFL in 1920. Along with the Chicago Bears, the club is one of two NFL charter member franchises still in operation since the league's founding. (The Green Bay Packers were an independent team until they joined the NFL in 1921). The club then moved to St. Louis, Missouri in 1960 and played in that city through 1987 (sometimes referred to as the "Football Cardinals" and / or the "Big Red" to avoid confusion with the Major League Baseball St. Louis Cardinals). Other less commonly used nicknames were the "Gridbirds" (used only by a local newspaper columnist) or "Cardiac Cards" (used only to refer to the 1975 team). Before the 1988 NFL season, the team moved to Tempe, Arizona, a college town suburb of Phoenix, and played their home games for the next 18 years at Arizona State University's Sun Devil Stadium. In 2006, the club began playing all home games at the newly constructed University of Phoenix Stadium in the northwestern suburb of Glendale, although the team's training facility is in Tempe, an eastern suburb. The franchise has two NFL championships, both while it was based in Chicago. The first occurred in 1925, but is the subject of controversy, with supporters of the Pottsville Maroons believing that Pottsville should have gotten the title. Their second title, and the first to be received through a championship game, came in 1947, two decades before the first Super Bowl game was played. In the six-plus decades since winning the championship in 1947, the team suffered many losing seasons, and currently hold the league's longest active championship drought. They have been to the playoffs six times and have won six playoff games, three of which were victories during their run in the 2008-09 NFL Playoffs. During that season, they won their only NFC Championship Game since the 1970 AFL-NFL Merger, and reached Super Bowl XLIII. The team has also won four division titles (1974, 1975, 2008, and 2009) since their 1947–1948 NFL championship game appearances. In 2012, the Cardinals became the first NFL franchise to lose 700 games. The franchise's all-time mark entering the 2013 season is 501-710-39. From 1988 through 2012 (except 2005, when they trained in Prescott), the Cardinals conducted their annual summer training camp at Northern Arizona University in Flagstaff. The Cardinals moved their training camp to University of Phoenix Stadium in 2013.